Bacardi-owned Grey Goose has partnered with some of New York’s leading bartenders to open an immersive cocktail and shopping experience in JFK International Airport in the lead up to Christmas. The Grey Goose Holiday Marché will open in JFK’s Terminal 4 on 3 December, offering travellers cocktails created by Jillian Vose of Dead Rabbit, Evan Hawkins of Broken Shaker, Liana Oster of Dante and Channing Centeno of Otis. Guests will be able to peruse the Holiday Marché’s offerings while sipping cocktails, which will include gift ideas such as the Grey Goose Holiday Tin, inspired by flour tins found in French bakeries and priced at US$45. 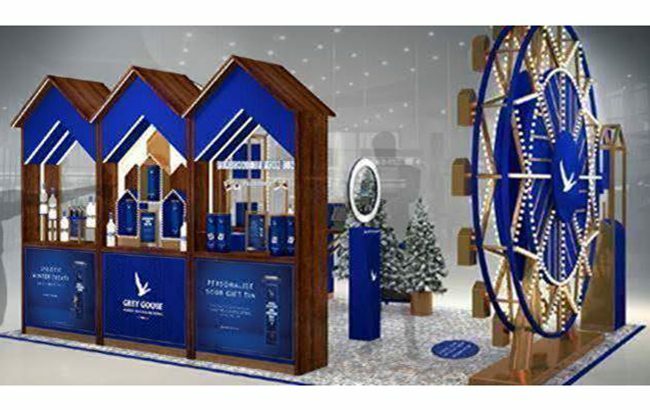 The pop-up will also feature a Grey Goose Ferris wheel, adorned with mini “chalets” that contain Grey Goose Christmas cocktail recipes. Consumers can pull a lever to open the chalet door and then photograph the recipe inside. Those who purchase the Grey Goose Holiday Tin, however, will be given a key that opens a hidden compartment containing a “special gift”. Mike Birch, managing director and vice president of global travel retail and commercial development, Bacardi, said: “With around five million passengers passing through JFK in December, the Holiday Marché is designed to enhance the travel experience this holiday season and provides Grey Goose with the ideal opportunity to interact with our target consumer.